Brylcreem is a brand of hair styling products for men. 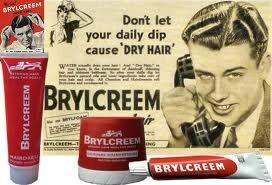 The first Brylcreem product was a pomade created in 1928 by County Chemicals at the Chemico Works in Bradford Street, Birmingham, England. The pomade is an emulsion of water and mineral oil stabilised with beeswax.